"Biryani " is a mixed rice dish with spices, rice, meat or vegetables. Though biryani is originated in Persia, it is more popular in Malabar areas in Kerala. In Malabar, biryani is served in each and every special occasions. Yes, the word biryani itself makes me a mood of celebration. Each Indian rice recipes are quite different in taste, flavor and the way of preparation. Kerala cuisine is very unique in its taste, flavor, and spices. 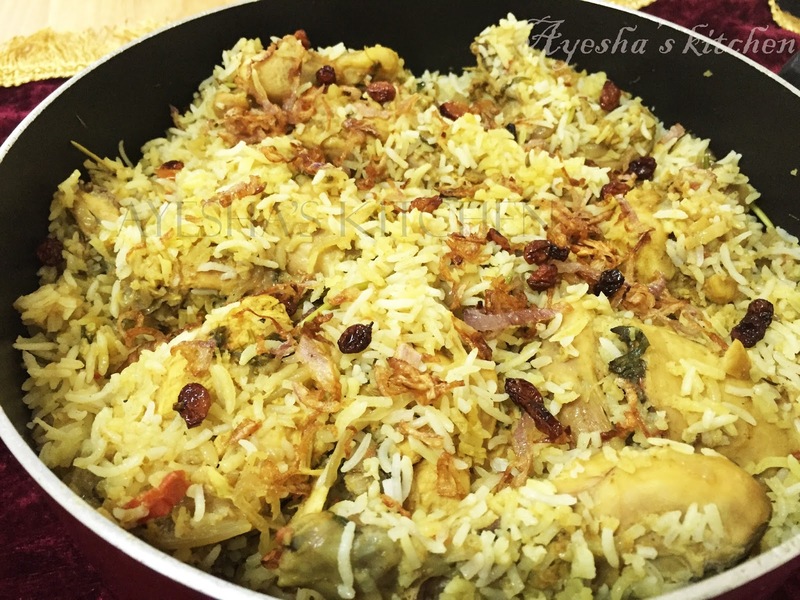 Thus Malabar Chicken dum biryani / Malabar chicken biriyani is always something very special as it is made with a special rice called khaima. And the blending of cooked rice and cooked chicken gravy ( called as dum) makes the dish an outstanding one.This rice dish is a traditional Malabar cuisine (one of the non-vegetarian cuisines in Kerala). In Malabar, biryani is served in each and every special occasions.So here I am going to explain to you how to make chicken biryani in Malabar style. I love making biryani whenever am stressed out. It really turns me around. So here is the recipe showing how to make Malabar dum biryani and know its recipes. Marinate the chicken with all the ingredients, as above given for the marination. Keep it refrigerated for half an hour. Now the next step is boiling the rice. So take a vessel and boil water (more than double the amount of rice). Saute onion until brown and then add tomato. Saute well, when done add the marinated chicken and close the lid. Allow it to cook for 5 minutes and then open the lid and again cook for another 5 minutes to get gravy thick. Close the lid tightly and can keep some weight on the vessel (optional). Or can close all the ends of the vessels with maida dough. Allow it to cook on very low flame for 30 minutes and our chicken biriyani is ready. Please watch yummy banana pudding (ethakka pudding) recipe below. Also please visit my malayalam food youtube channel for more pudding recipes.